In his work, Swiss visual artist Fabian Oefner likes to bring together the fields of art and science. Creating stunning images that capture events normally invisible to the human eye, his creation process usually involves phenomena such as sound waves, centrifugal forces, iridescence, fire and even magnetic ferrofluids, which aim to expose the beauty hidden in the minute and fleeting aspects of the world around us. 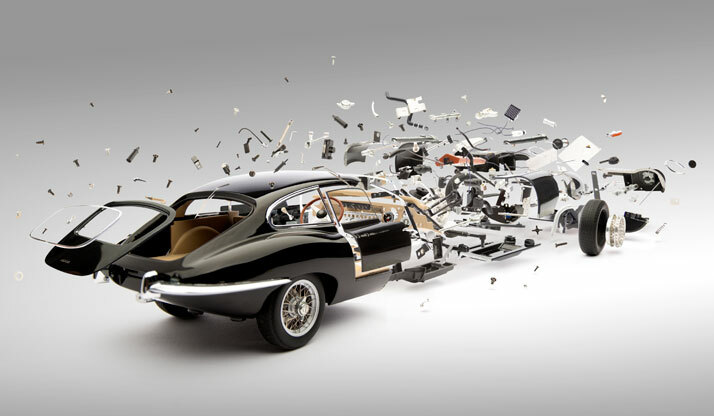 Black Jaguar E-Type (1961); Disintegrating 03, photo © Fabian Oefner. 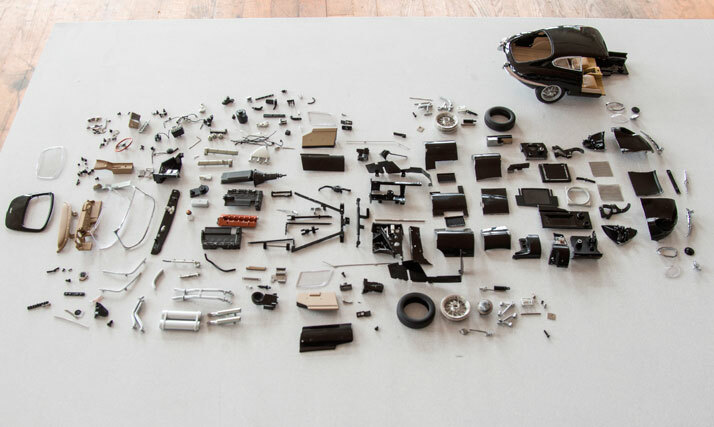 Black Jaguar E-Type (1961); Disintegrating series (making of), photo © Fabian Oefner. 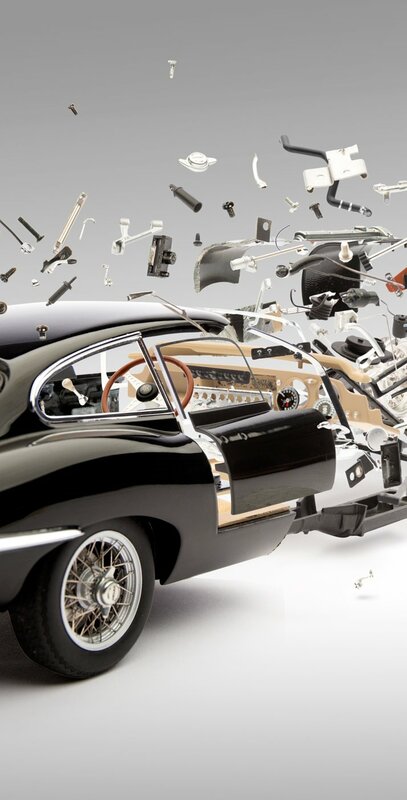 Black Jaguar E-Type (1961); Disintegrating 03 (detail), photo © Fabian Oefner. Ferrari 250 GTO (1962); Hatch 03, photo © Fabian Oefner. Mercedes-Benz 300 SLR Uhlenhaut Coupé with gullwing doors (1954); Disintegrating 01, photo © Fabian Oefner. Oefner’s latest twofold project is a series of six photography prints, combining his signature crisp visual style with the alluring design of racing cars. 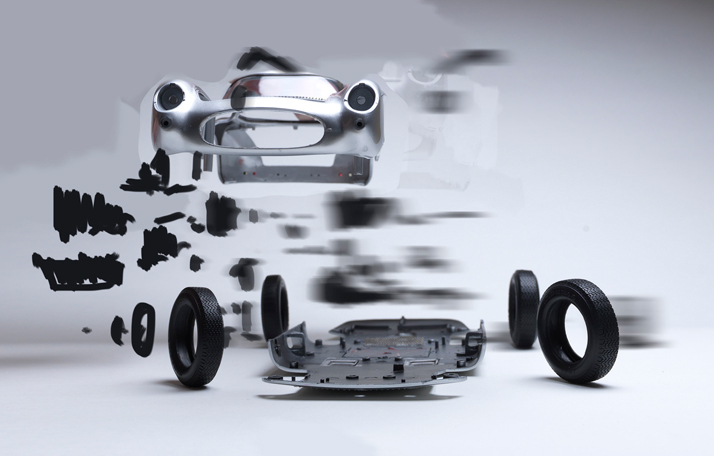 Titled Disintegrating and Hatch, the two parts of the project explore (each in a different way) the relationship between time, space and the fascinating complexity of the moving machine that is the modern automobile. 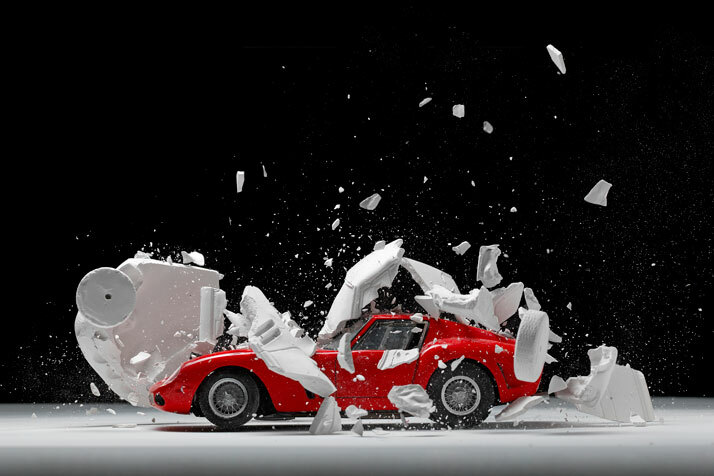 Ferrari 330 P4 (1967); Disintegrating 02, photo © Fabian Oefner. 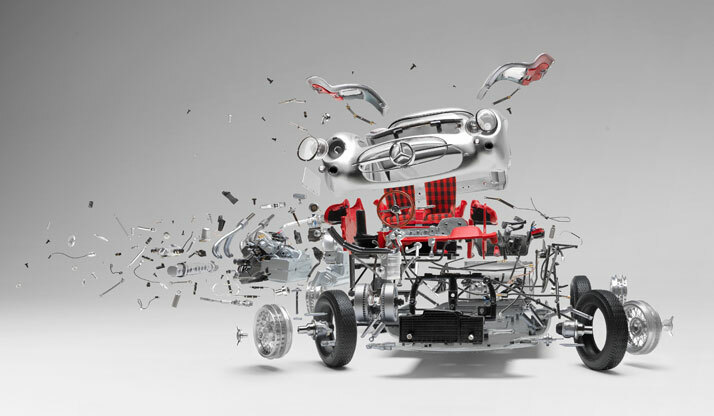 In the Disintegrating series, Fabian Oefner creates the illusion of a moment, frozen in time, by sculpturally recreating explosions of classic sports car models – namely a 1954 Mercedes-Benz 300 SLR Uhlenhaut Coupé, a 1961 Jaguar E-Type, and a 1967 Ferrari 330 P4. For each image the following process was followed: after carefully dismantling the model, Oefner then took a picture of each and every piece of it (down to the smallest screw) held in place by thin pins and strings. The hundreds of resulting images were then put together using Photoshop in order to create the final photograph. ''What you see in these images, is a moment that never existed in real life'', says Oefner. ''There is a unique pleasure about artificially building a moment… Freezing a moment in time is stupefying''. 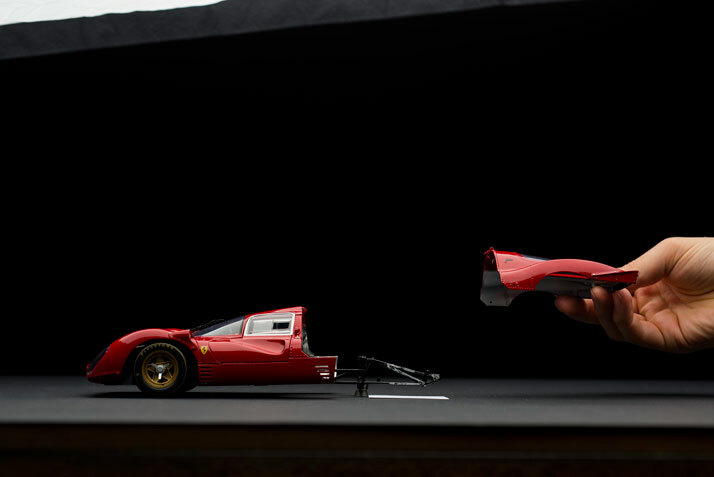 A somewhat more ‘analogue’ based method was deployed for the Hatch series, where the model of a red Ferrari 250 GTO (1962) appears to be breaking out of a shell – an image resulting from Oefner’s idea of a car being ‘born’ in an organic way. 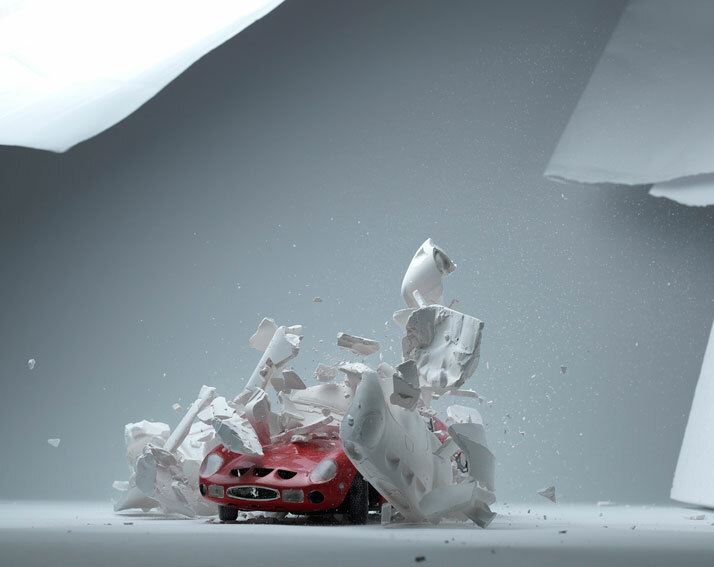 To achieve the spectacular bursting effect seen in the Hatch images, he smashed thin car-shaped gypsum shells onto the model, a step he had to repeat many times until the desired result was achieved. So as to capture the exact moment of impact,Oefner ingeniously installed a microphone in the car model, whereby every time the shell hit the car’s surface the impulse triggered the camera shutter and flashes. 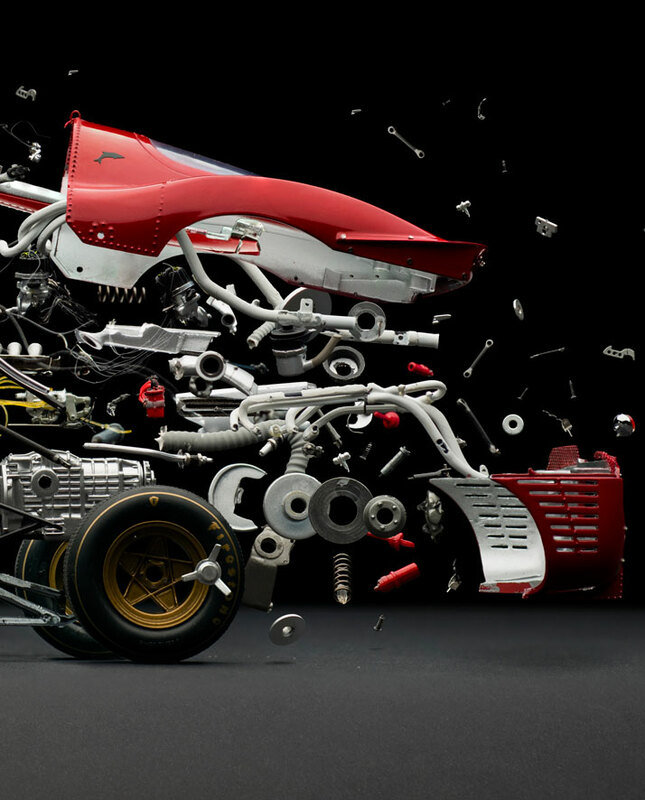 Ferrari 330 P4 (1967); Disintegrating 02 (detail), photo © Fabian Oefner. 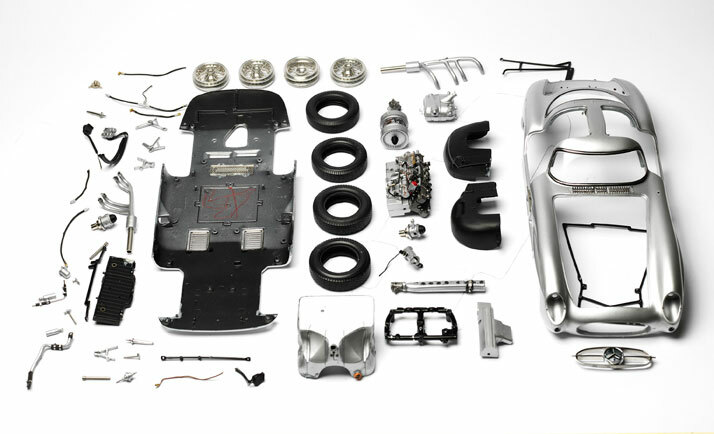 Mercedes-Benz 300 SLR Uhlenhaut Coupé with gullwing doors (1954); Disintegrating 01 (making of), photo © Fabian Oefner. 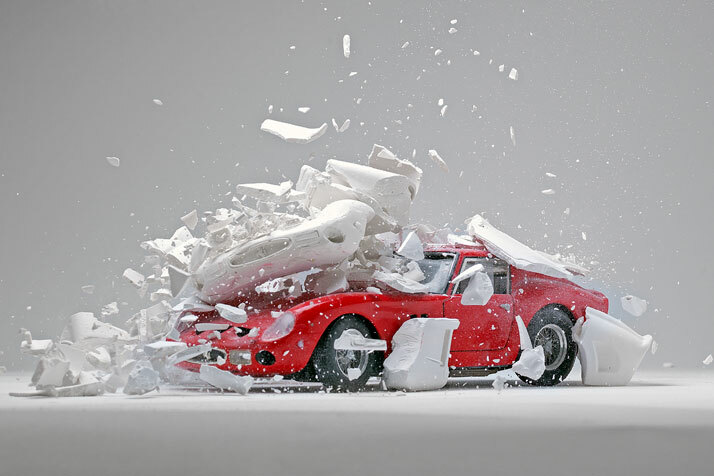 Ferrari 330 P4 (1967); Disintegrating 02 (making of), photo © Fabian Oefner. Hatch 01, photo © Fabian Oefner. 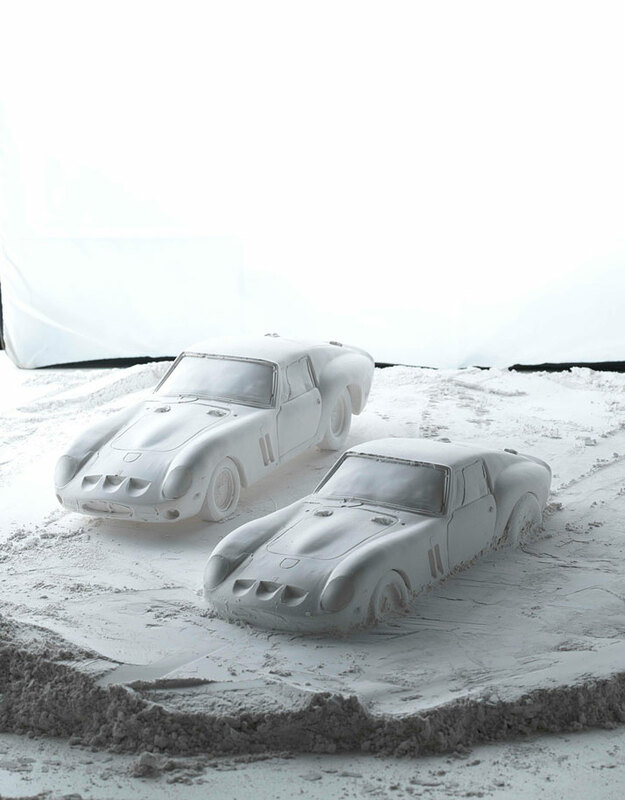 Gypsum shell of the Ferrari 250 GTO (1962); Hatch series (making of), photo © Fabian Oefner. 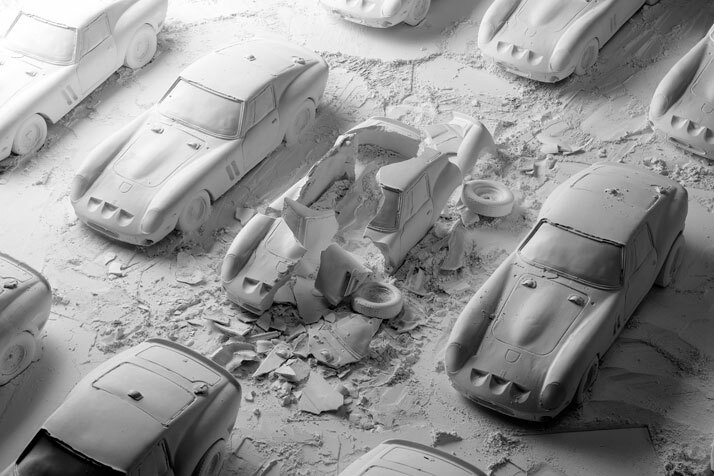 Hatch series (making of), photo © Fabian Oefner. 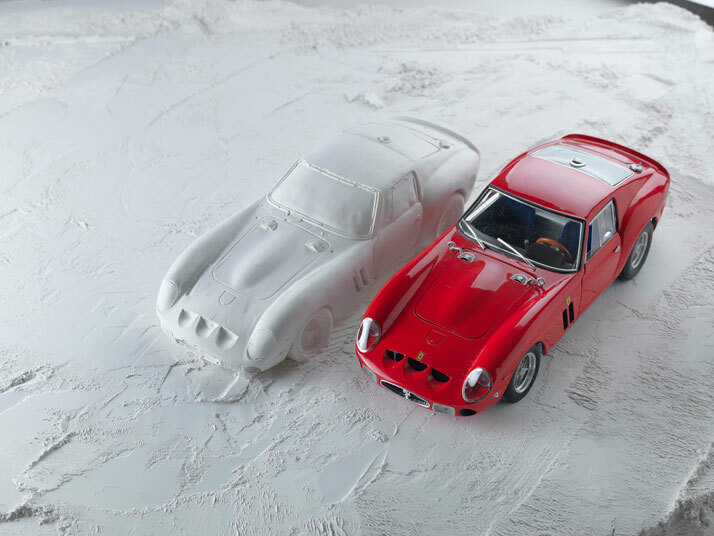 Ferrari 250 GTO (1962); Hatch 02, photo © Fabian Oefner.